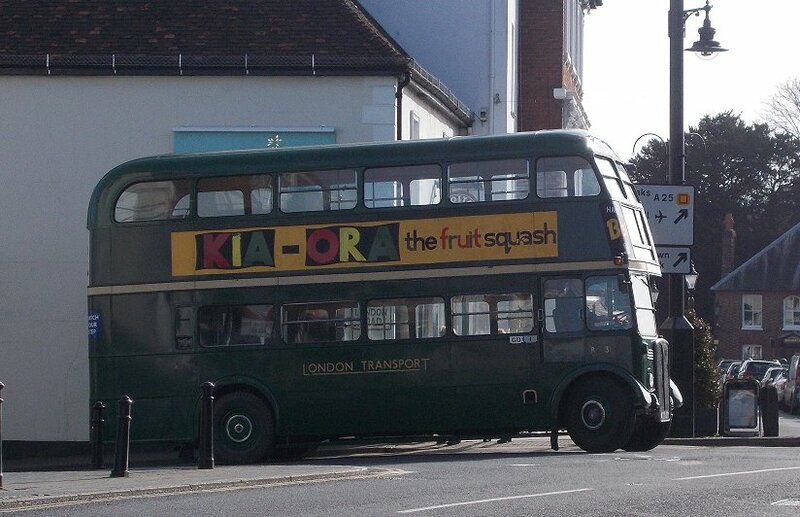 Prepared by Ian Smith, 17th April 2015. 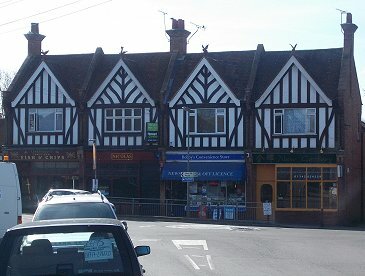 After an excellent breakfast I checked out from the King's Arms in Westerham. The bus stop is right outside the door. 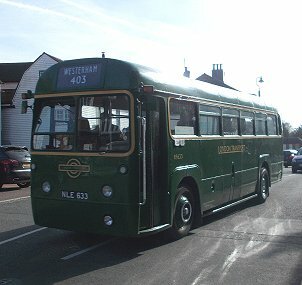 RT3148 arrived from the Chelsham direction at four minutes to nine, and went down towards the old station to turn. 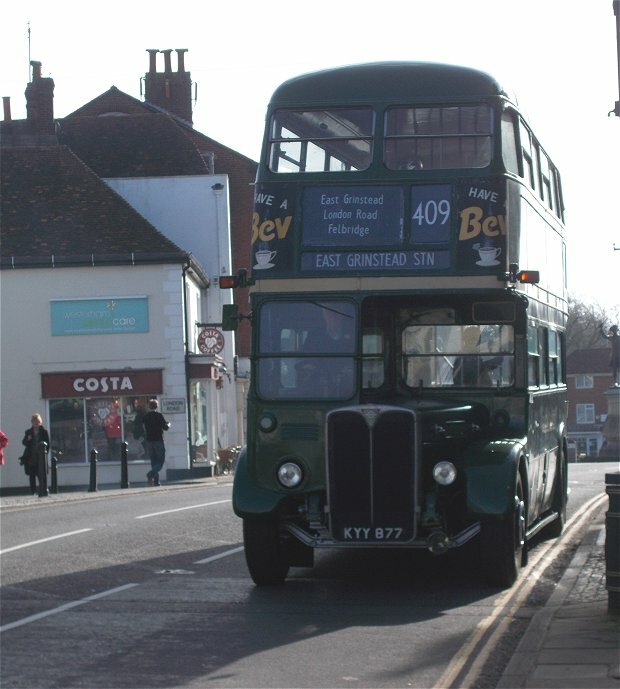 No messing about: three minutes later it was back, ready to head west to Godstone Green. 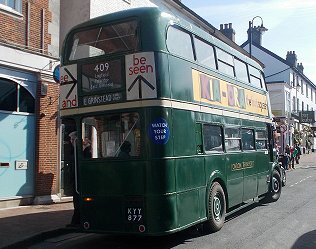 The RT was wearing East Grinstead blinds that did not include the 410. 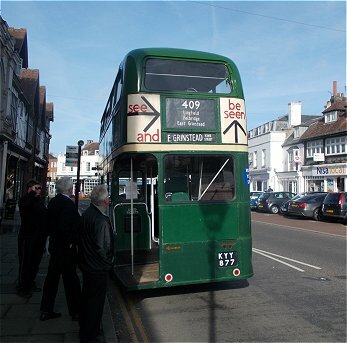 RT3148 arrives in Westerham, heading to the old station - then returns three minutes later. 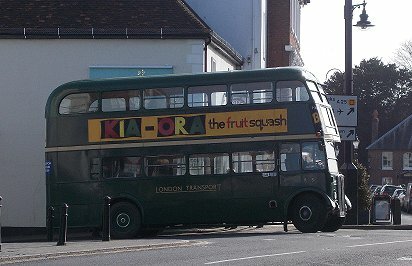 RT3148 stands outside the Kings Arms. 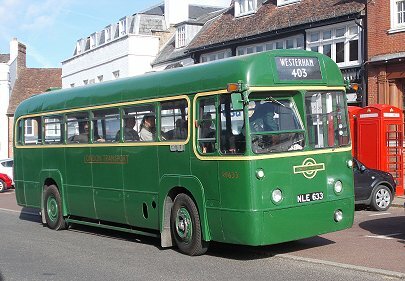 The connecting 246 from Bromley arrived, bringing a contingent of enthusiasts, who walked across from the Green to join us. Then RF633 arrived, as a 403 from Sevenoaks. It swept past, going towards the Croydon Road to reach a turning point, as it was to continue as a 485. A few minutes later it was back, now in the sunshine outside the George and Dragon. 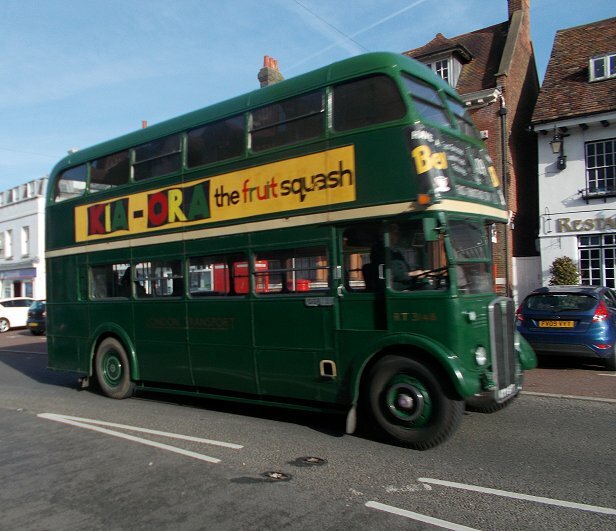 RF633 arrives from Sevenoaks as a 403.. and returns to stand as a 485. 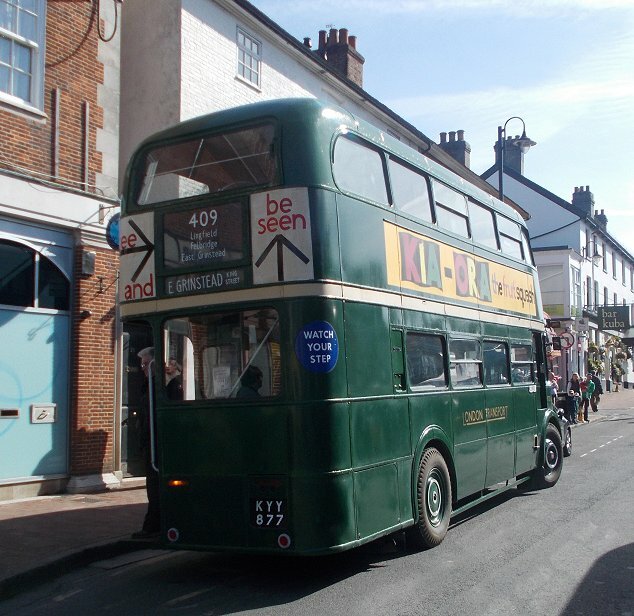 A classic connection at Westerham. 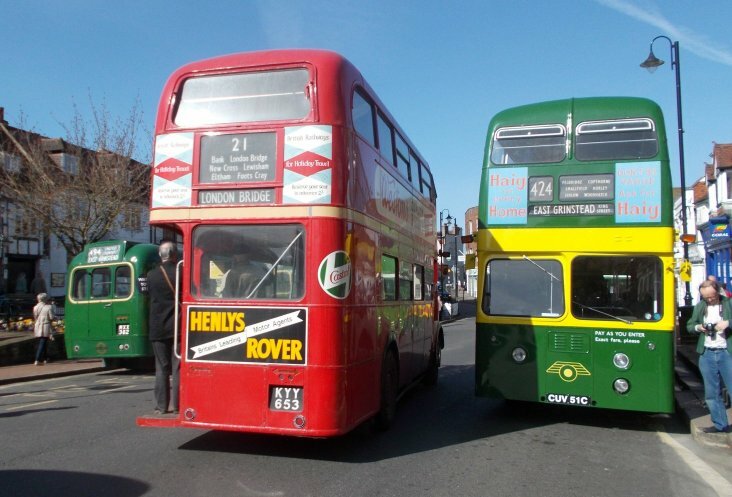 Folk distributed themselves between the two buses, and we set off in our opposite directions. I had chosen RT3148 today. 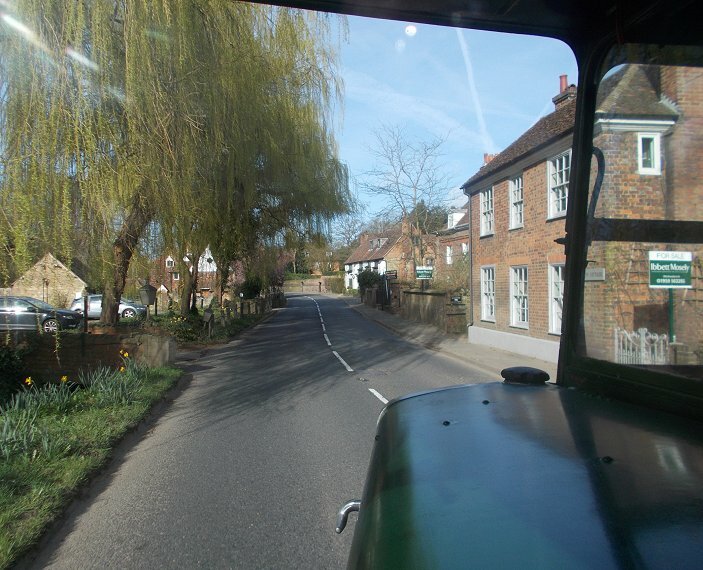 We headed out of Westerham - a pretty village, showing plenty of Kentish vernacular building, set off by advancing spring and sunshine. We climbed the long slope towards Limpsfield, breasted the ridge, and dove down towards Oxted. 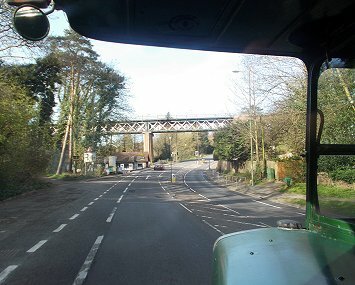 No turning off the main road into Oxted on this feeder run: we went straight down and under the tall railway viaduct. RT3148 heads west along the A25, out of Westerham, and past Oxted. 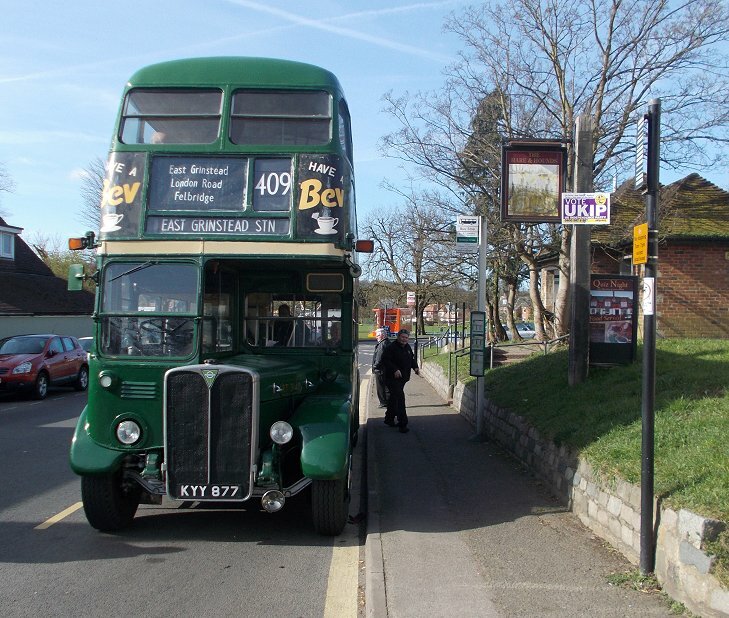 Nor did we take in Old Oxted, but roared up the hill onto the Greensand Ridge and headed west for Godstone Green. 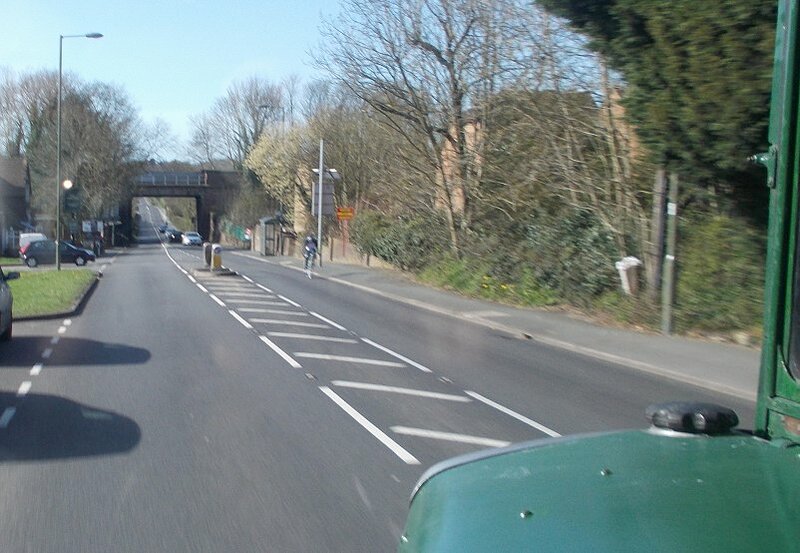 There we did make a complete turn round the traffic island, to pull up briefly at the Hare & Hounds stop. 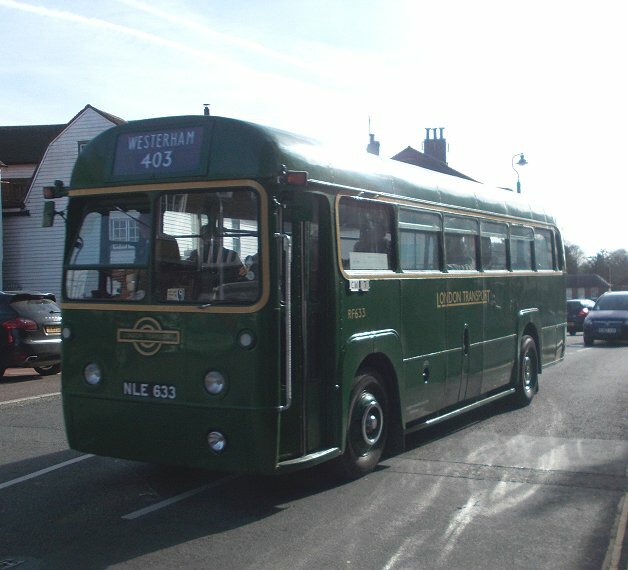 After a break to use the facilities we headed on south, now on the 409 route proper. We descended to South Godstone, to duck under the Redhill-Tonbridge Railway, and climbed up onto Blindley Heath. 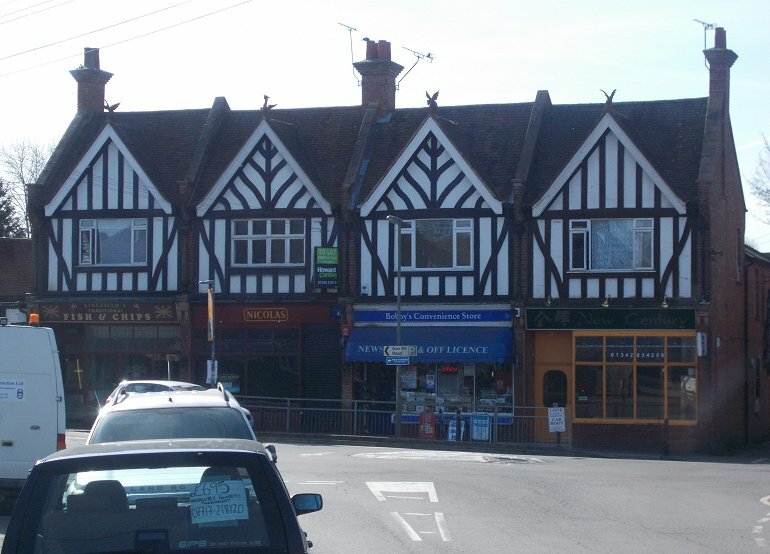 We made the left turn onto the Lingfield Road, and ran along to the village. 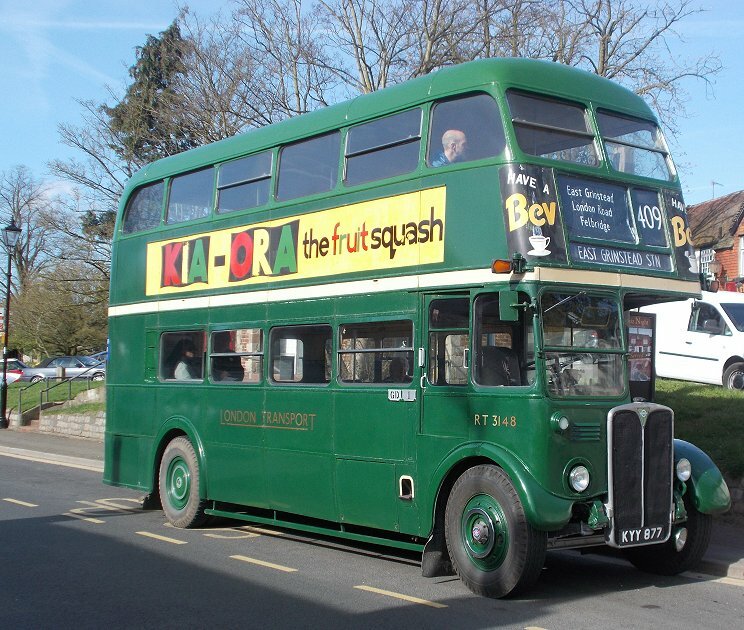 A twirl round the mini-roundabout and we headed on south-west towards Newchapel Roundabout and the opulent headquarters of England's Mormons. South again, and we came down to Felbridge Star, before the slow, traffic-ridden crawl up into East Grinstead. 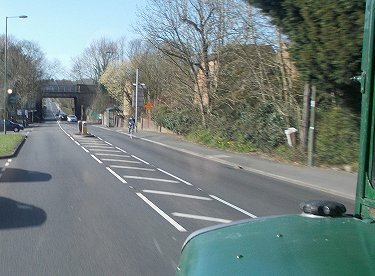 A Metrobus Scania (6531) headed the other way towards Crawley. We turned right, down to visit the station, but there was no-one to pick up just now. 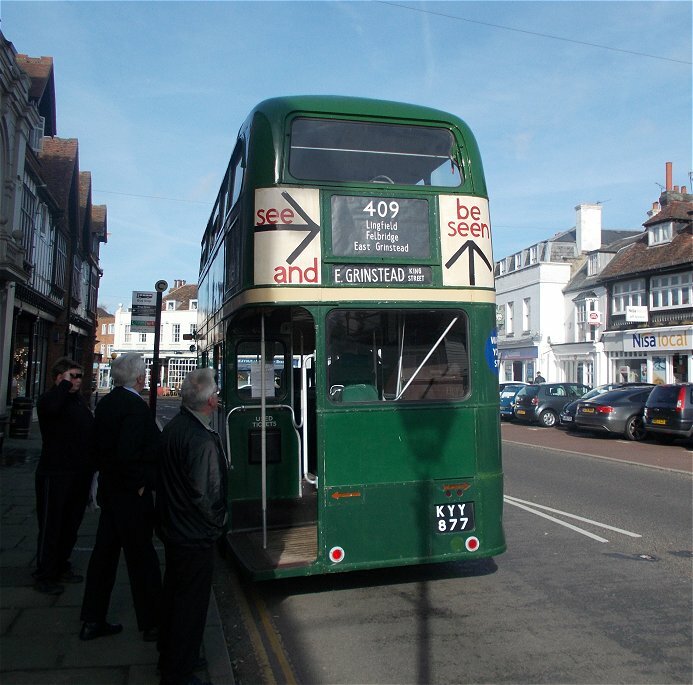 We completed the evolution round the traffic system and headed up the High Street, to crawl round past the traffic barriers to stop by The Crown. The street was busy with a colourful collection of buses - by no means uniform Lincoln Green and cream. I alighted from RT3148 and went to have a look. 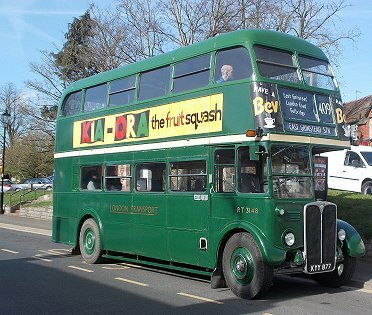 East Grinstead: RT3148 has arrived. GS62, RT1798, XF1 await their duties.